Autobiography at Sadler’s Wells. Photo: Richard Davies. I have watched a lot of dance at this stage and sometimes I just have to admit: I don’t know what is going on. I have seen works by Wayne McGregor before. I am dazzled by the technical virtuosity of his dancers every time. Over the course of watching Autobiography, I see so many splits, so many superlatively controlled disruptions of carriage and line, so much torrential physical energy directed with such microscopic precision, that I start to feel a sense of unreality. McGregor’s choreography is so exacting, so detailed, so persistently immense that climax blurs into climax, and individual instances of amazement begin to thrum and merge. I forget that an ordinary human body cannot do the things these dancers are doing. There’s a numbing repetition of outstanding skill that begins to push back at attempts to parse the work, scene by scene. Sometimes, there’s a break in the hard perfection and a surprising, limpid softness shows through in the choreography, seemingly gesturing towards a more narrative explanation, but it is always swallowed before I can grab it. There are scenes, I gather that much. Autobiography is a memoir done as only McGregor could. His entire genome was sequenced in summer 2017. There are 23 scenes – choreographic events from a ‘life library’ – which are selected from and performed in a random order every night, based on an algorithm itself based on that sequence. No two performances are alike. Tonight, I watch some of the 23 scenes in their random algorithmic selection. Their titles, revealed on a screen above the stage, are mysterious. The scenes themselves are mysterious. In one, two women appear to fight and then comfort each other, a dramatic tug-of-war energy electrifying all the places that they touch. 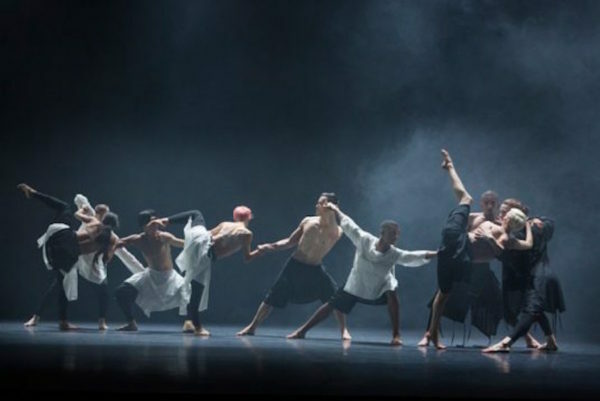 In another, individual performers dart, scramble and spasm across the stage, with a light cutting out at the height of Jlin’s electronic beats, but not in perfect tandem with the movement, lending an air of apocalyptic hallucination to the proceedings; what ‘outside’ are these dancers up against? In another, the magnificent pyramids on the ceiling of Ben Cullen Williams’s set design lower almost all the way to the floor, trapping the performers inside. My plus one and I anxiously squeeze one another’s hands. What does this mean? What’s happening? When I think of autobiography, I think of attempted truth telling. I think of people attempting to impose narrative and sense on the unending and unhappy chaos of existence. I think, above all, of communication. I am stunned, but I do not think I have learned anything more about McGregor from this autobiography. I have learned only that he has lived something, and has repeated it in dance, like a man translating between two language that I cannot read and do not know the alphabets for. I am a dance critic, some of the time, and I ought to know a lot more about dance. Perhaps I have to simply admit that I’m not supposed to know what’s going on. This is galling. It is literally my job to tell you what I think was going on. When I ask my plus one – not a dancer, not a dance critic, not a choreographer, not, actually, a regular dance-goer unless he is my plus one, but a scientist – what he thinks, his face is clouded with frustration. He wants to know, why is he supposed to care? When you hide your autobiography in obscurity, and place difficulty and privacy at the heart of the public performance, what are you expecting from your audience? Are you, in fact, trying to make your audience who aren’t dance people feel stupid? Do the people who don’t ‘get it’ simply not belong here? We bat these rhetorical questions back and forth. We still don’t know what we’ve seen. “Wayne McGregor is impressive,” I suggest. Maybe that’s all that an autobiography needs to be. It gives you the measure of the man, and this one is a bigger deal than either of us small fry, who tell our autobiographies to each other over pizza, unobscured, unrigorous, unmanned. Autobiography was performed at Sadler’s Wells. For more details click here.